Alyssum Rosie O'Day Lobularia Maritima is a compact-growing annual native to Europe, Asia, and northern Africa. Also called Sweet Alyssum or Sweet Alice this garden annual can be easily started from seeds. 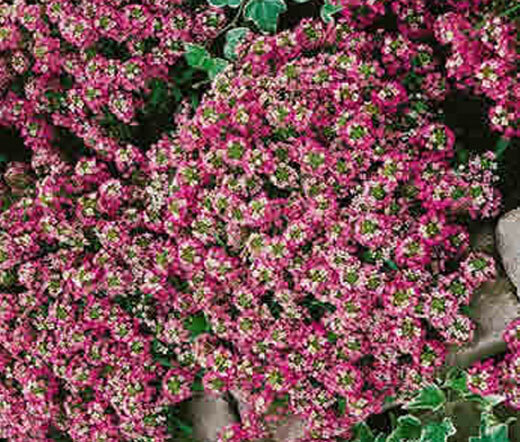 Alyssum Rosie O'Day forms a hearty, low maintenance ground cover that is covered with beautiful clusters of scented, pink-rose blooms. Alyssum begins to bloom in spring and its fragrant blooms appear all summer and fall until first frost attracting bees and butterflies. This Alyssum blooms all year round if planted in USDA zones 9-11. Alyssum Rosie O'Day is an outstanding border and edging plant, alpine and rock garden flower, and this Alyssum is a wonderful companion with pansies, sweet william and parsley in a container. Lobularia Maritima enjoys full sun or partial shade, and moist, but well-drained soil is desirable for growing this plant.